Welcome yet again to another instalment of my favourite post I do every single month. 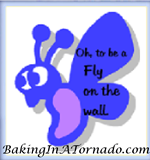 Yes, it is time yet again for Fly on the Wall. For any of you here who are new to this, what happens is every month a bunch of us bloggers join up and share some of the crazy stuff that you would see were you a fly on the wall at our house. Today there are nine bloggers joining in the fun, so be sure to visit them all and keep the fun going. Mum and I were watching telly one night Mum: I think the person speaking is that woman, oh what's her name? Angela Mayo? Me: Who? Mum: No, wait, it's Maya Angelou. Eliza goes to high school just across the road from our house, so sometimes she comes to visit us during her lunch time. One day she needed to escape a couple of mean girls so she came over and called her mum. Sam: Are you having troubles with bitchy girls again? Eliza: What? Itchy gills? I don't have itchy gills. Kim: I was not paying attention this morning when I was getting ready for work, and I forgot to put my skirt on. It wasn't until I walked out the door that I noticed it was really cold. Then I looked down and realised I was standing in the front yard wearing just my work shirt and my stockings. One day I went to pick Miss K up from kindergarten and the head teacher made us all wait before leaving so she could let us know the children witnessed one of their pet chickens eating a frog that day. She also informed us the children had stopped the teachers from interrupting the chicken's tasty meal. I was pretty sure Miss K wasn't too traumatised by this event since she insisted on playing the chicken chases the frog around our living room for the rest of the afternoon. The next week I found out from Miss K that the kindergarten's pet yabby Sam had passed away too. Upon checking the kindergarten's Facebook page I found pictures from the funeral they held that day. Me: They had a funeral for a yabby at kindergarten today. I don't know how I feel about this. The kids even decorated his coffin. Mum: I just want to know if they played rock lobster as they buried it. Nat: I would love, just to mess with people, to spell my son's name George, but have it pronounced Henry. Me: I suppose it's better than naming your son cod-eye Nat: It's not cod-eye, it's Codi. Me: If you spell your son's name like that I will call him cod-eye and nothing else. Kim: Erin how do you have your coffee? Me: I like my coffee strong and sweet, just like me. Kim: Ok If it's just like you I'll add a dash of autism to the water. Sam and Jason were discussing a local supermarket Sam: I don't want to go back there. We bought our chompy up thing from there and it broke almost immediately. Me: Chompy up thing? Are you talking about a mulcher? Sam: Yeah. The chompy up thing. Miss K was lying on the couch one day making weird noises with her mouth. Mum: Oh look, she's jukeboxing. Me: I think the word you're looking for is beat boxing mum. Kim: I lashed out this afternoon and bought a new jacket. Me: You punched someone for a jacket? Natalie got sent home from work with a sore back last week, but couldn't resist being a smarty pants when her boss was worried about her. Boss: How are you going to drive home? Natalie: holds her hands up like she is steering an invisible car. Like this. Boss: If you are not careful I will pick you up and throw you back into the baby room. Kim had a tiny fender bender a few weeks ago, there was no real damage to either car, so it was mentioned once and then I forgot about it entirely. I did however manage to scare the crap out of dad when he thought he'd let the cat out of the bag. Dad: How bad is the damage to Kim's car Me: I didn't know there was any damage to Kim's car. Did she have another accident? Dad: No, I don't know what you're talking about. Weren't you leaving? Me: Did someone side swipe her or did she run into them? Dad: I think it was a combination of both. Me: Oh wait, I remember now, it's ok, you've not told me anything I didn't already know. Kim: Hey mum, what do you call it when you send smoke signals? Mum: Um, sending smoke signals. I had to do some shopping for mum, so I grabbed some money from her purse. Me: Hey Miss K, I'm stealing granny's money. Don't tell her ok? Miss K: Gran, mum is stealing your money. Mum: What?!? Miss K: (whispering) Don't tell. Nat: Aargh, it's so bright...I'm just staring at my future. Me: Miss K's dad has made all kinds of grand plans for Miss K's visit during the holidays. He's taking her to the zoo, and to that giant Ferris wheel. Mum: Good grief, she'll be exhausted. Me: Meanwhile, Miss K's requests for activities have been the park, the pool and the car wash. Mum: That's my girl. Me: If her dad just listened to her, he'd save himself a fortune on admission tickets. Dad: How is Kimberley going now? Me: She's doing ok. Dad: And how are you coping living with her? Me: I threw a shoe at her yesterday if that answers your question. Dad: Why did you throw a shoe at her? Me: Oh I said something that bugged her so she threw her shoe at me. So I waited until she came back and lobbed it at her as hard as I could. She ended the fight by throwing a banana at me. I wasn't going to waste a good banana on her. Me: Why is Kim posting a picture of clothes racks and asking if you remember her game of hide and seek in them? Mum: Oh when she was a kid she tried to hide in one and pulled it all down on top of herself instead. Me: Of course she did. Me: That's it, if I ever need to ride a bike during magpie season, I'm going to wear a huge afro over the top of it Mum: Ok then. Me: It's the helmet they hate, so if I cover it with a giant wig they'll leave me alone. Plus it's totally legal to wear a wig over your helmet. Mum: In that case why just do it during magpie season? Do it for funsies. Me: That's just what I'll do. All year round, afro helmet. Well that's all from me for this month, don't forget to keep the buzz going and visit the other bloggers participating today.